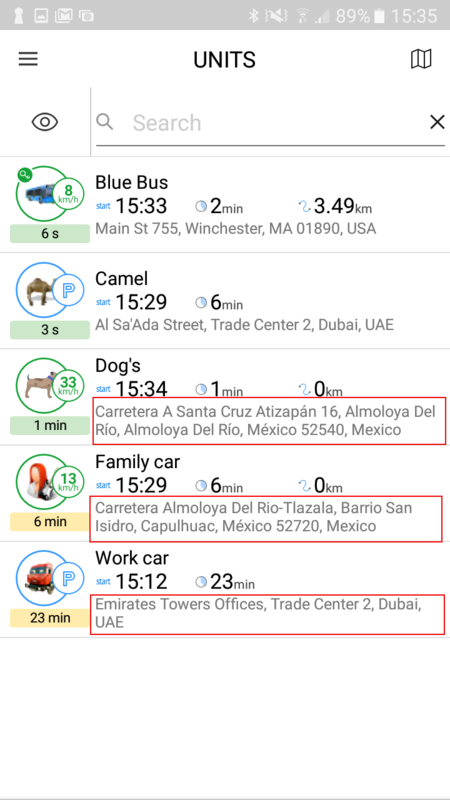 Two years have passed since the first version of Wialon mobile client was released to ensure non-stop tracking from anywhere globally. Since then we’ve achieved significant results: 17 interface languages, 61 000 active users and 100 000+ downloads! The success is determined by constant product development and enhancement. Wialon Mobile 1.9 is the first release for iOS and Android in 2017, but mainly 2016 has brought us the app we enjoy every day. 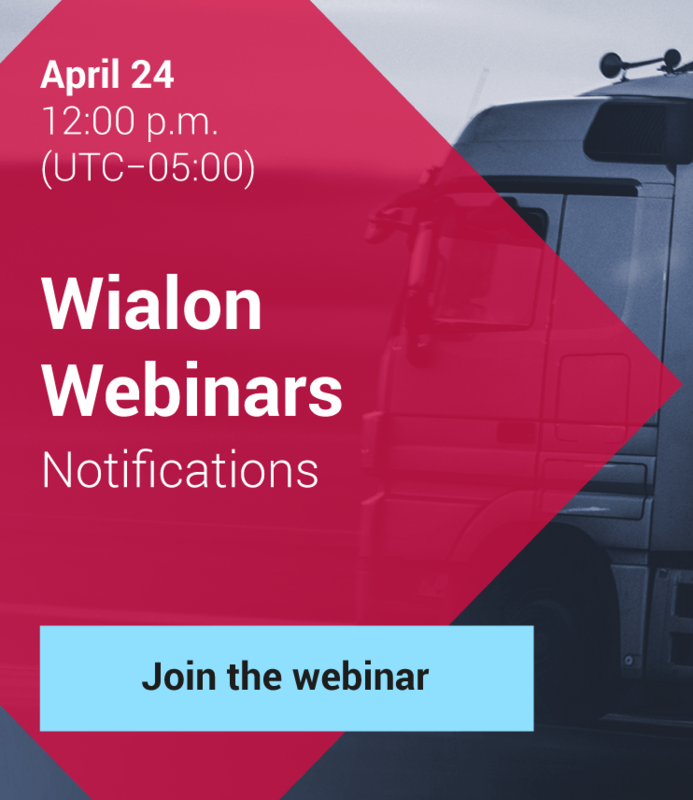 That’s why we would like to remember the modifications made in Wialon mobile application and tell you about what’s new is expected in the new version. 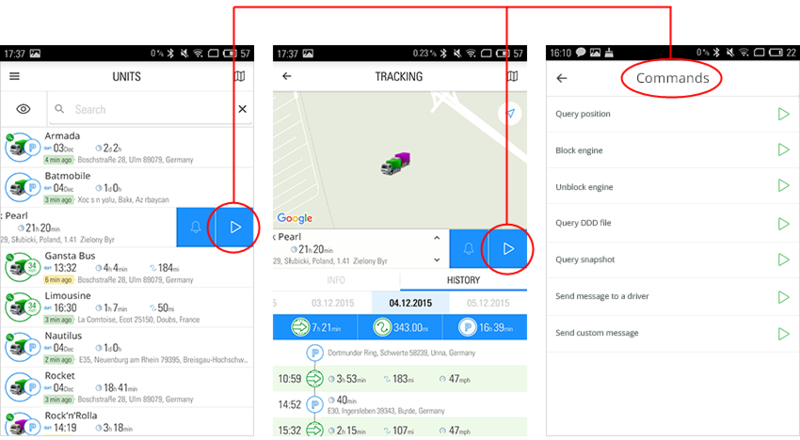 Apart from the new version for Wialon Local 1604 we can boast of the extended functionality of Wialon Hosting mobile client which is capable of much more than observing units on the map. Geofence grouping. A handy display of overlapping geofences on the map made it more convenient to view geofences on a mobile device screen. Commands. The list of commands has been extended and edited. Moreover, we added the option to send configuration files to units. That way you can change hardware configuration from your smartphone. Notifications. The new versions were supplemented by advanced push-notifications. In addition, we finalized notification name display and added the corresponding filter, allowing you to easily find the necessary notification. Maps. Scaling elements were added allowing for simple map zooming and unzooming for those using one hand to navigate the application. Locator. Locator tool has become available in mobile application. 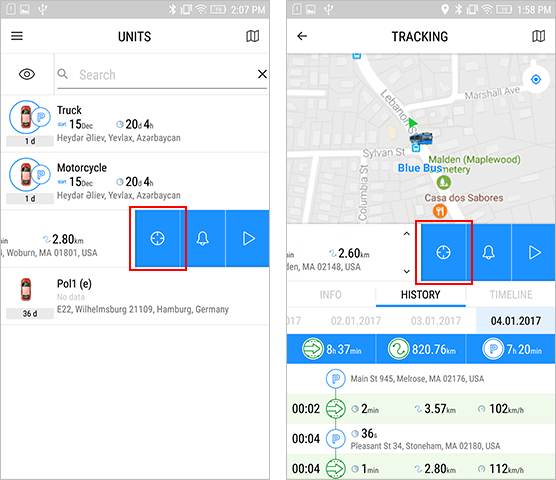 You can send links for location sharing either from ‘Units’ or ‘Tracking’ modes. MapBox. MapBox component has been supported. The custom maps, already utilized by Uber and Foursquare, are a real delight for those feeling bored by using standard mapping services. Screen lock block. The new function allows you to perform any tasks without worrying that the screen will blink off at the critical moment. Top chart by Gurtam. We added 10 new sounds for mobile notifications. Among other things, much has been done to optimize the performance of Wialon Mobile for both iOS and Android. The mobile client has become faster and error frequency tends towards zero. 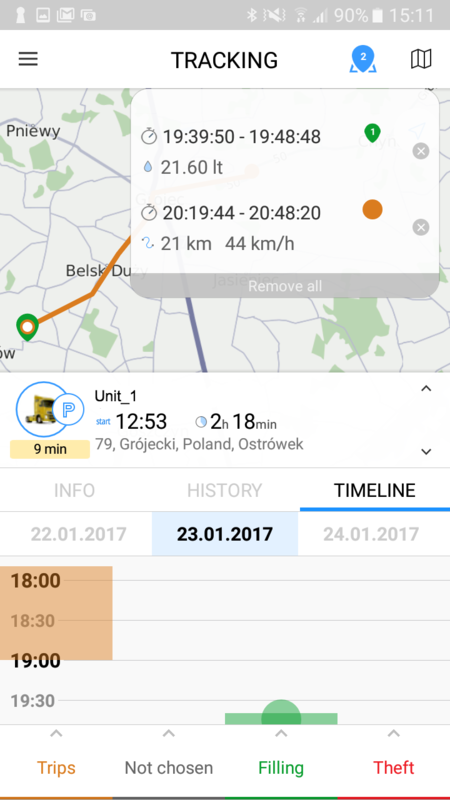 Timeline events on the map. The function assures quick access to tracks and event markers on the map. Timeline scaling. Now you can easily manage event intervals from 1 minute to 24 hours, which makes even the shortest intervals easily visually perceivable. Full address display. 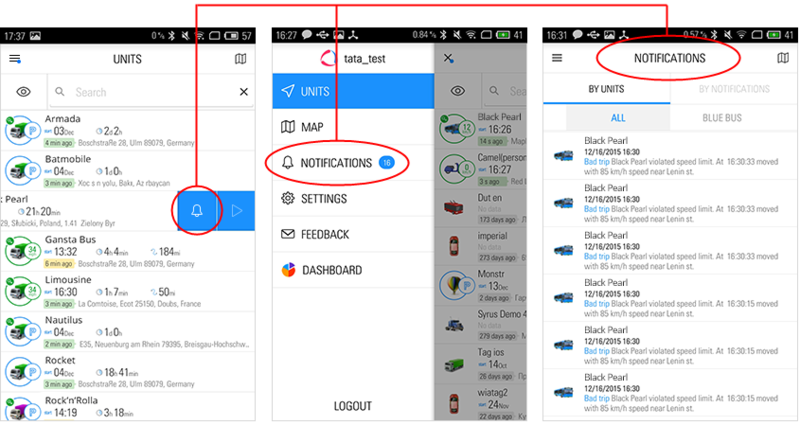 The new way to display address information helps the users spending most of their time in mobile application to use extended info for accurate navigation. Fuel fillings and thefts detection based on start time. The new method allows for minimization of errors occurred when detecting fuel thefts/fillings based on end time. 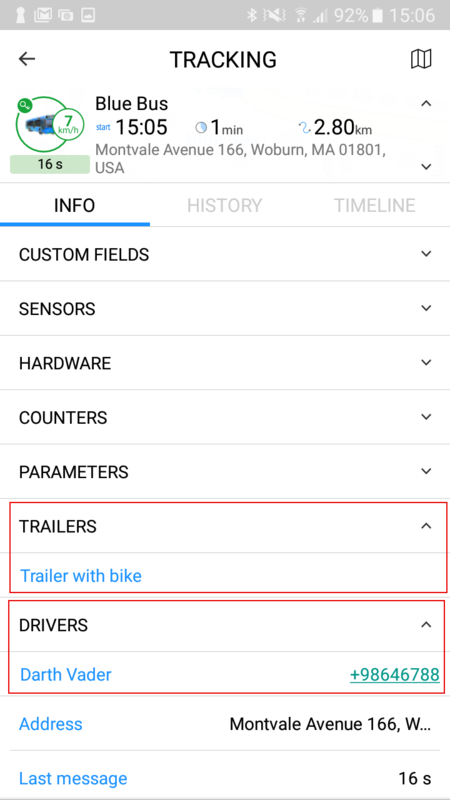 Information on drivers and trailers in INFO tab and clickable phone numbers. You get quick access to additional information and make phone calls right from the app. “Messages” service access check. Unit parameters may contain private information. To block access to data in messages in mobile client you can disable “Messages” service for the necessary account. We never stop and hope that in 2017 Wialon Mobile will as well accompany you throughout your business day and beyond.